Three sheets of felt cost 75 cents at my local craft store. I cut out some simple shapes in duplicate, stitched on the "icing" first, pieced together the shapes, and stuffed with wool stuffing. A little amateurish, but there's always room for improvement. If I had pinking shears, I'd definitely make a batch of these cookies that Melissa made. 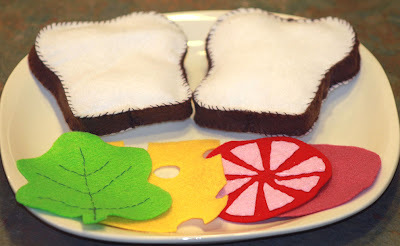 And in another post here, she graciously provides us with all kinds of links to felt food tutorials. I have an artist friend who lives across the country. She sent me pictures her first attempt at felt food. She made these without any instructions. (She's a genius that way). And this: the drumsticks have velcro incase your toddler needs a snack now. I've asked my friend to think about doing a tutorial for us (pretty please). In the meantime, go get 75 cents worth of felt, and whip up some cookies! Welcome to your new addiction! Felt food is so much fun! Yours look great and your friend is a genius. Some people can just look at fabric and know things eh? Now I want to make a cake though, give me an excuse to use some of the great vintage ric rak I have! p.s. Thanks for the mention! Oh yeah, and if you want good pinking shears ont he cheap, take a 50% off coupon into Michaels. Recycled wool is great for play food too! I think merino is fabulous for making felt. I'm going to have to try some of this! I've seen all the wonderful felt food on etsy and been tempted to try to make some myself but seeing the prices led me to believe it was super hard to do. Maybe I'll test it out, even if it's a disaster I'm out 75 cents. Thanks for the confidence...those cookies are adorable! Just found your blog, and I love these felt cookies! I can't wait to try it. My two year old is very into pretend, so I think he will love these! Thanks for the idea! Awesome job! 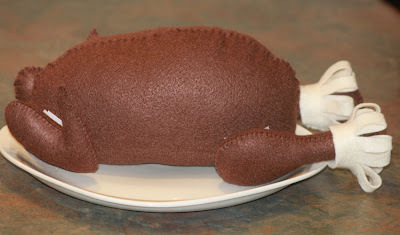 I love the turkey - too cute!! I totally agree.......felt food can be super expensive. I love making felt food for my kiddos......so fun to see them playing with it! right! Hand carved and painted wooden food is cheaper than felt food on etsy it is crazy!